Accurate, relevant and timely financial information is key to making good decisions for nonprofit executives and board members. But do all of your board members really understand the numbers they receive and what they mean to your organization? For example, let's say you're trying to determine how and when to initiate a new program? Do the numbers you provide convey the right information? Your board members probably come from different walks of life and different positions in the community. Some of them may have financial backgrounds, but many of them might not. And it's this latter point you need to keep in mind as you supply financial data. Board-designated net assets: Net assets set aside for a particular purpose or period by the board, such as safety reserves or a capital replacement fund, that have no external restriction by donors or by law. Net assets released from restrictions: The transfer of funds from donor-restricted to unrestricted status based on satisfying donor-imposed stipulations with respect to the timing or purpose of the contribution (or, in rare cases, due to permission of a donor of permanently restricted funds). Also consider providing your board with financial training. Bring in outside speakers, such as accountants, investment advisors, and bankers. Additionally, financially savvy individuals on your board — they may make up a separate finance committee — can be asked to share their financial expertise with the rest of the board. One of the most common financial documents to circulate is the statement of financial position (the balance sheet). It shows an organization's assets (cash, accounts receivable, and property and equipment), liabilities (accounts payable and long-term debt) and net assets (unrestricted, temporarily restricted and permanently restricted resources). Long lists of numbers can have a dizzying effect on readers. But adding a pie chart can quickly show your board the composition of your nonprofit's assets. 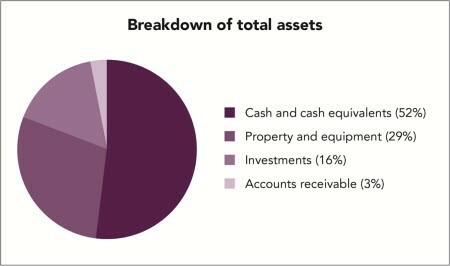 See the chart "Breakdown of total assets." At a glance, anyone can see that cash and cash equivalents are the largest part of this not-for-profit organization's total assets and a much smaller percentage is composed of investments and accounts receivable. Or, you could create a two-slice pie chart that shows what portion of total assets can quickly be converted to cash (cash equivalents, investments and accounts receivable) vs. the portion that cannot (property and equipment). A different example: You could create a pie chart to show how your annual event was funded last year. For example, money from attendees, sponsors and general contributions. This tool can help a board make quicker and better-informed decisions — in this case, guiding them in setting or readjusting their funding expectations this year. The statement of activities (the income statement) is another commonly circulated financial document. It generally starts with total support and revenue, including reclassifications from restricted to unrestricted. Then expenses, including program, management and general and fundraising, are deducted to arrive at the overall change in net assets. A bar chart is a good way to present this information: It can visually compare current revenues and expenses with those of previous periods. By updating the bar graphs on, say, a monthly basis, you can help non-financial board members easily compare revenues and expenses to the budget on a continuing basis. Your annual budget assumes a particular level of support and revenue. If you don't obtain certain grants — or if you sell less in program services than anticipated — your board will need to revisit anticipated expenses and make adjustments accordingly. An informational graphic is one way to quickly relay a heads-up. With so many not-for-profit organizations finding themselves in a cash crunch, you should add another report to your repertoire: a cash flow analysis. You can present your total cash for the period in a simple spreadsheet, as well as anticipated cash inflows and outflows for the coming month. This can help your board make important short-term decisions, such as applying for, or drawing down on, a line of credit. If your answers to these questions are "no" or "I'm not sure," you may want to reassess the usefulness of the financial information you provide. Many entities have experienced cuts in funding and donations in the sluggish economy and, as a result, have reduced costs. If you supply board members with ratios for both the current year and prior year, they can see at a glance if these costs have been cut sufficiently. 1. Management and general costs to total support and revenue. 2. Program services to total support and revenue. 3. Fundraising expenses to total support and revenue. 4. Fundraising expenses to donations (including deferred gifts). These ratios allow your board to see if the not-for-profit's costs and revenues are in line with its expectations, as expressed, for example, in the budget. Let's say that your management and general costs are $200,000 for the coming year and the total support and revenue for the organization is $2 million. You'd have a highly impressive ratio of 1:10 — 10% of every dollar earned is spent on administrative costs, with the remaining 90% available to fund programs and supporting activities. Another useful ratio is the "current ratio." This comparison of current assets to current liabilities is commonly used as a measure of short-term liquidity. For example, a ratio of 1:1 means an organization would have just enough cash to cover current liabilities if it ceased operations and converted current assets to cash. Members of the community agree to become board members because they want to make a difference. And it's up to you to supply them with information they fully understand so that the decisions they make are informed ones. Gain more guidance on how to best steer your board financially, along with other critical strategies to create financial sustainability for your nonprofit an upcoming seminar. Click here for more information.